Peter is 16 and lives at home with his family. He is profoundly disabled and attends a special needs school. 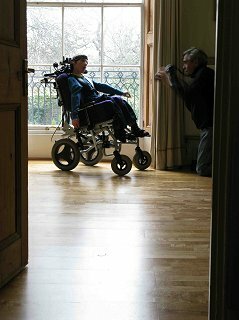 For me, it was a real pleasure to work with Peter, his mother and carer on this shoot because it took me back 35 years to when I started out in social work as a houseparent in a school for disabled youngsters. This was care at its most ‘raw’, with scrupulous attention to detail in caring for every aspect of the young people’s needs. And watching Peter’s mother and carer as they assisted Peter in moving, eating and keeping him occupied accentuated just how vital carers are to the community. Yes, things go wrong in social work and the press hover round the leftovers of tragedies before embarking on a tirade of abuse and vitriol against social work and care. But for every isolated tragedy, there are hundreds of thousands of wonderful examples of care 24/7, 365 days a year. 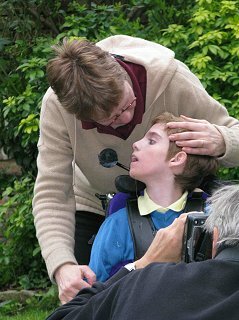 Peter’s life is brimming with love, care and fulfilment and we hope that people visiting the site get a feel, through Julio Etchart’s images, just how much there is to admire in care in the UK. The images on the blog were taken by Sheena Kelliher, a talented graphic designer who was involved in directing the shoot. We are exhibiting at the prestigious Publishing Expo this week and look forward to meeting you at Stand A112.